The Raven has been another interesting addition to the breeding avifauna of Cheshire (but not quite the Metropolitan Borough of Wirral) since the First Atlas, with their nesting in 1991 the first confirmed in the county since 1857 (Wells 1994). They have rapidly taken to nesting on man-made structures and, provided that they can find sufficient food, the adoption of this habit means that there is probably no limit to their distribution. Traditional nest-sites are on cliffs, which were soon occupied, and Cheshire Ravens now nest in trees (with a preference for Scots Pines), quarries and a range of tall industrial structures – oil storage tanks, power station chimneys, Jodrell Bank radio telescope, a hilltop telecommunications mast and electricity pylons. Probably the best-known local nesting site was in Chester, on the Town Hall or Cathedral from 1996 to 2003. The spread of the Raven into Cheshire has paralleled that of the Peregrine, and indeed there is now an annual competition on the county’s sandstone cliffs between the two species. Ravens usually win, being bigger birds, and earlier nesters, thus in possession before the raptor; once having re-established their nest-site, however, they seem to come to an uneasy truce with the Peregrines. Twenty years ago, who would have thought that we could watch aerial battles between these two species in the heart of Cheshire? The rise in population has been a national phenomenon. 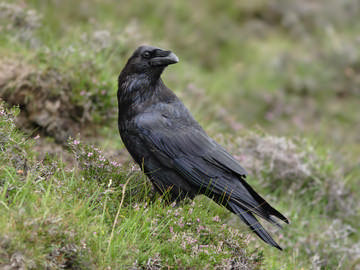 With strongholds in south-west England, Wales, Cumbria and Scotland, Ravens were not well monitored by the BTO’s Common Birds Census; but, since the instigation of the Breeding Bird Survey, with a wide national coverage, the population index in England has more than quadrupled from 1994 to 2005. During this time, the Welsh population has also doubled and it is likely that the Cheshire birds originated in Wales or the Shropshire hills. The adults probably mate for life, and maintain their territory year-round. Some traditional nest-sites are occupied for decades, the nests themselves becoming enormous structures. Ravens appear to be amongst our hardiest birds, and may start laying eggs as early as the first week of February; most birds in the lowlands are sitting by the first week of March. They endure hard weather in some years, but their wool-lined nests are very warm, and the timing coincides with peak availability of food for chicks, during the lambing season. They lay quite large clutches, 4, 5 or 6 being normal, and the female incubates the eggs for about 21 days while the male keeps watch for intruders, calling her off with an alarm call when intruders, including humans, get too close. An average of three chicks fledge after 6 or 7 weeks in the nest, and then undergo a long period of dependency on their parents, flying as family parties until July, then the young birds disperse and join flocks. Ravens will eat almost anything, but they are, first and foremost, scavengers and in effect our vulture substitute. In medieval times, they, along with Red Kites, acted as our urban waste disposal system, but gradually their distribution became confined mainly to the sheep-farming hills, and typical analyses of Raven pellets from upland Britain find half or more of their diet from sheep, with one quarter rabbits and hares, and the rest comprising small mammals, beetles, vegetable matter and a wide variety of other food. In some areas, though, lagomorphs (rabbits and hares) dominate – often taken as roadkill – and few sheep remains are found. This is likely to apply in Cheshire with its low density of sheep, but there are no direct observations of the food taken by Ravens in our area and an analysis of pellets would be useful. The habitat codes submitted by fieldworkers are not very informative, because some observers have clearly recorded just the nest-site, rather than the wide area over which the birds have foraged. In practice, Ravens probably cover any of the Cheshire farmland habitats and tend to avoid areas of dense woodland and built-up places. Territories may be large, several km2, although they may share good feeding grounds such as overstocked fields of sheep. The Raven, the world’s biggest passerine, does not breed at one year of age. Some can breed at 2 years old, but most do not start until the age of 3 or older: ‘the average age of first breeding … is simply not known for the Raven’ (Ratcliffe 1997). It is clear that there will be a considerable population of immature birds, probably wandering quite widely, and some adult pairs may hold territory without breeding: estimation of the population is not straightforward. Only twelve out of the 22 confirmed breeding records refer to nests, with the rest either sightings of recently-fledged chicks (RF) or adults with bulging crops returning to the area of a nest (FY); some of these could be from nests in an adjacent tetrad. There were 5 records of display and 22 of ‘pairs’, some of which were likely to be dispersing adults or two immature birds associating together. Adopting a conservative approach, during this atlas period there were probably about 25 pairs of Ravens breeding in Cheshire. In its traditional strongholds, occupying areas of suitable habitat, Ravens nest at a nearest-neighbour mean spacing of 2 to 4 km, and achieve a density of around one pair per 10 km2, i.e. one pair per 2.5 tetrads. The county population could thus increase way beyond its present level and a special survey of Ravens in five or ten years’ time would be valuable in monitoring its spread.